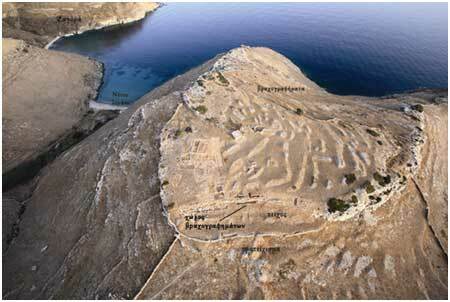 The excavations on the plateau of Strofilas, on the west coast of Andros, have unearthed the ruins of a large settlement belonging to the “Attica-Kephala” cultural horizon of the Final Neolithic (FNL) period. Its growth is attributable largely to the strategic location of Andros near Attica, especially the area around Lavrion, coupled with the fact that it was an important hub and port of call on the Neolithic sea routes for the transport of goods (e.g. Melian obsidian and metal ore) and the transmission of technology and ideas between the Cyclades, the Mainland, Euboea and the NE Aegean. On the evidence available to date, a number of factors make Strofilas unique in the Cyclades and the surrounding geographical region (Euboea, Attica): a. The large area of the settlement, along with its dense layout and large buildings. b. The communal projects, such as the fortification, the sanctuary and the extensive rock-art representations. c. The abundance of high-quality finds, and d. The advanced technology (e.g. metalwork, stonework). The extensive rock art representations in excavated context, with symbolic motifs (motif in the form of a ring-idol pendant, figure-of-eight patterns reminiscent of human footprints, pecked marks in spiral arrangement), linear motifs (spiral, meander), pictorial motifs (ships, animals-goats, deer, jackals, fish, dolphins, etc. 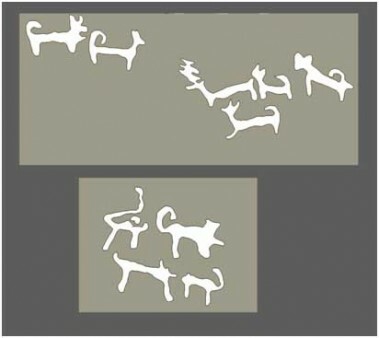 ), narrative scenes (flotilla of ships, jackals hunting deer, seabed with dolphin and its calf, probably a human figure or an anthropomorphic xoanon, 0.45 m. high, possibly representing a deity). It seems that long before the development of pictorial art in the Cyclades, in the Middle and Late Bronze Age (pottery, wall-paintings), the Neolithic artists laid the foundations of the iconographic vocabulary and spatial management in complex scenes. Representation of jackals hunting deer, at the bed-rock north of the fortification wall. 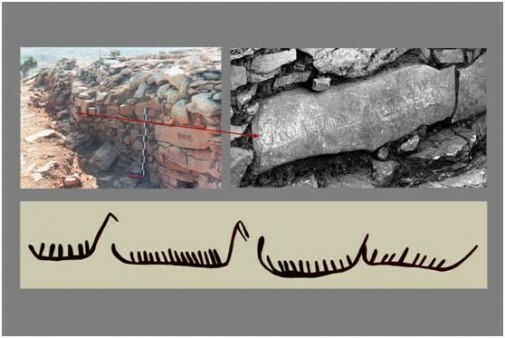 The intense maritime character of the settlement (shipbuilding / seafaring / trade), which is documented by more than 100 depictions of ships in the rock art in public places (sanctuary, fortification wall, area north of the wall) as the community’s prevailing symbol. Representation of a procession of ships, at the central bastion of the fortification wall at Strofilas. The use of a sophisticated and widespread communication code using a system of symbols (motif in the form of a ring-idol pendant, figure-of-eight patterns reminiscent of human footprints, pecked marks in spiral arrangement). The evidence indicates that this was a thriving proto-urban settlement of maritime character, which undoubtedly played an important role in a wider network of smaller and/or similar-sized settlements during the Final Neolithic (FN) period. Strofilas reveals new information on the culture of the Aegean, particularly in the Cyclades, during the FN period, expanding the horizons of Cycladic prehistory and iconography. It demonstrates that during this period an advanced culture took shape in the Cyclades, with large organized maritime societies and similar settlements with early urban structures, which were the basis for the subsequent cultural developments of the Middle and Late Bronze Age.